Note: Creator didn't break his maiden until his sixth lifetime start. He started at Churchill Downs in September 2015 and was second in his debut, then fifth at Keeneland, second again at Churchill, and second at the Fair Grounds in December. He was second again at the Fair Grounds in his 2016 debut then finally broke his maiden at Oaklawn in February. 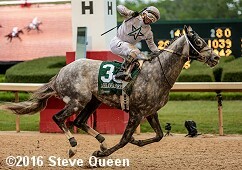 He then finished third in the Rebel Stakes (G2) then won the Arkansas Derby (G1) in his final Kentucky Derby prep. He had a bad start in the Kentucky Derby, finishing 13th. He skipped the Preakness to wait for the Belmont Stakes. He rallied from far back in the Belmont Stakes to win by a nose over pacesetter Destin.